This multipurpose, dual-ended swab has a pointed cotton tip on one end and a cuticle pusher on the other, offering added convenience for nail technicians during manicure and pedicure treatments. Dual Ended Flat/Oval Tip Swab with White Handle. Safety Information: Do not insert swab into ear canal. Entering the ear canal could cause injury. If used to clean ears, stroke swab gently around the outer surface of the ear only. Keep out of reach of children. Dual Ended Point Tip Swab with Wood Handle. Safety Information: Do not insert swab into ear canal. Entering the ear canal could cause injury. If used to clean ears, stroke swab gently around the outer surface of the ear only. Keep out of reach of children. 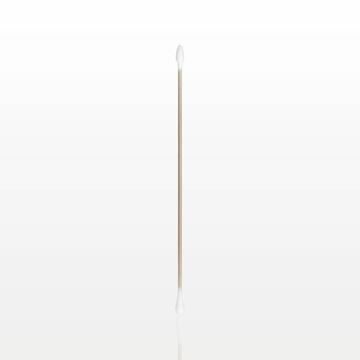 These best selling point/round luxury white cotton tip 3 inch long swab is perfect for makeup application or spot skin treatments. The tightly wound heads don't leave fibers behind. Use the point tip for precision applications and the round tip for smoothing or applying to larger areas. The white paper handle is biodegradable. Safety Information: Do not insert swab into ear canal. Entering the ear canal could cause injury. If used to clean ears, stroke swab gently around the outer surface of the ear only. Keep out of reach of children. These dual ended round tip swabs have durable plastic handles and tightly wound cotton heads. The convenient, plastic cylinder container holds three hundred swabs. Safety Information: Do not insert swab into ear canal. Entering the ear canal could cause injury. If used to clean ears, stroke swab gently around the outer surface of the ear only. Keep out of reach of children. Our dual ended round white cotton tip swab with paper handle can be used for a variety of cosmetic or industrial general purpose applications. Safety Information: Do not insert swab into ear canal. Entering the ear canal could cause injury. If used to clean ears, stroke swab gently around the outer surface of the ear only. Keep out of reach of children. 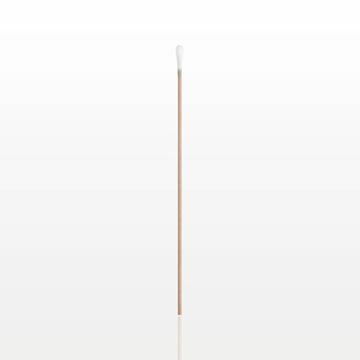 Dual Ended Round Tip Swab with Wood Handle. Safety Information: Do not insert swab into ear canal. Entering the ear canal could cause injury. If used to clean ears, stroke swab gently around the outer surface of the ear only. Keep out of reach of children. 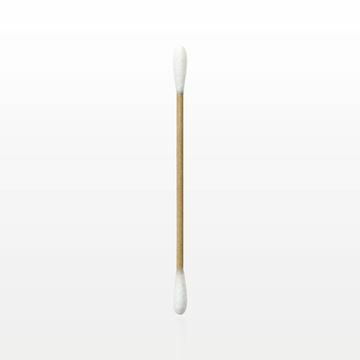 Extra Small Single Tip Swab with Wood Handle. Safety Information: Do not insert swab into ear canal. Entering the ear canal could cause injury. If used to clean ears, stroke swab gently around the outer surface of the ear only. Keep out of reach of children. 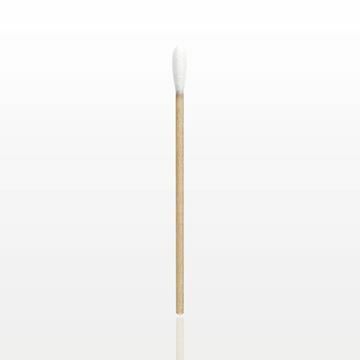 These 6 inch cotton swabs with wooden handles are perfect for spot skin treatments, wound care, industrial cleaning or testing makeup and skincare in a hygienic environment. Packaged in a paper autoclave bag for sterilization purposes. 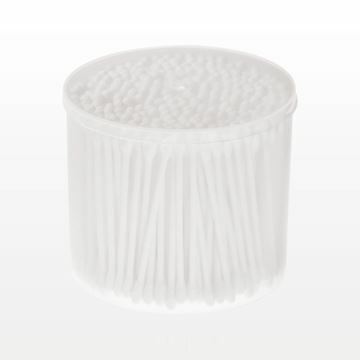 These round/round tip luxury cotton swabs have larger heads to cover more surface areas for application or cleaning. Each 3 inch swab will stay clean and ready for your next application in the cylinder with flip top lid. 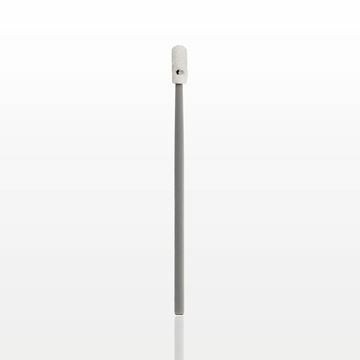 The white paper shaft is biodegradable and the tightly wound heads provide smooth application. Safety Information: Do not insert swab into ear canal. Entering the ear canal could cause injury. If used to clean ears, stroke swab gently around the outer surface of the ear only. Keep out of reach of children. Luxury cotton swabs are excellent for makeup application, testing or sampling. This 3 inch swab offers a tightly wound cotton point/point tips that permits a clean application. These swabs are individually wrapped to ensure they remain clean until used. This luxury cotton swab has tightly wound white cotton flat oval/point heads. 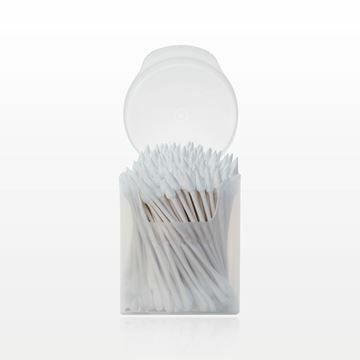 These swabs with white paper shafts come in a reclosable polypropylene container to keep contents clean and fresh. Custom labeling is available if you would like to offer these prepackaged swabs at retail. Safety Information: Do not insert swab into ear canal. Entering the ear canal could cause injury. If used to clean ears, stroke swab gently around the outer surface of the ear only. Keep out of reach of children. 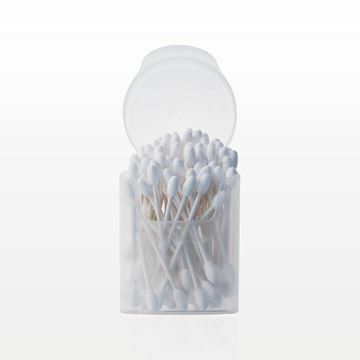 Luxury cotton swabs are excellent for makeup application, testing or sampling. 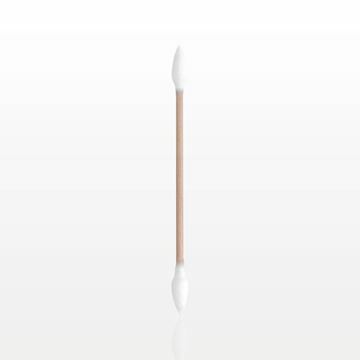 This 3 inch swab offers a tightly wound cotton point/round tip that permits a clean application. These swabs are individually wrapped to ensure they remain clean until used. Safety Information: Do not insert swab into ear canal. Entering the ear canal could cause injury. If used to clean ears, stroke swab gently around the outer surface of the ear only. Keep out of reach of children. Our comprehensive selection of tightly wound cotton swabs are available in a variety of head shapes including round, oval, and pointed. We carry cotton and rayon swabs with miniature, fine and precision tips. The handle options include wood, plastic and biodegradable paper. The tightly wound fibers are less likely to shed during product application or makeup removal. For procedures where hygiene is critical, we provide individually wrapped swabs. Complementing our general purpose products, we have a specialty line of swabs that deliver unique capabilities. Our precision swabs are available in cotton, polyester, and nylon materials. These swabs boast increased durability and are useful for a variety of tasks, from applying acetone to industrial and fiber optic cleaning. Within our extensive line of applicators, our disposable cotton swabs stand out with their quality and versatility. Effortlessly apply cosmetic products with our tightly wound cotton swabs. We specialize in makeup cotton swabs that are ideal for quick touchups, makeup removal, testing or product sampling. Swabs with small tips make the perfect tool for precise esthetic techniques. Swabs with large, rounder tips cover areas quickly, streamlining the application and removal of skin care products. A dual-ended swab adds convenience and value. Offer a new swab each and every time to help maintain hygienic cosmetic practices. Our knowledgeable customer service specialists can provide information on the wide variety of cosmetic cotton swabs we provide that meet a range of specialized needs.